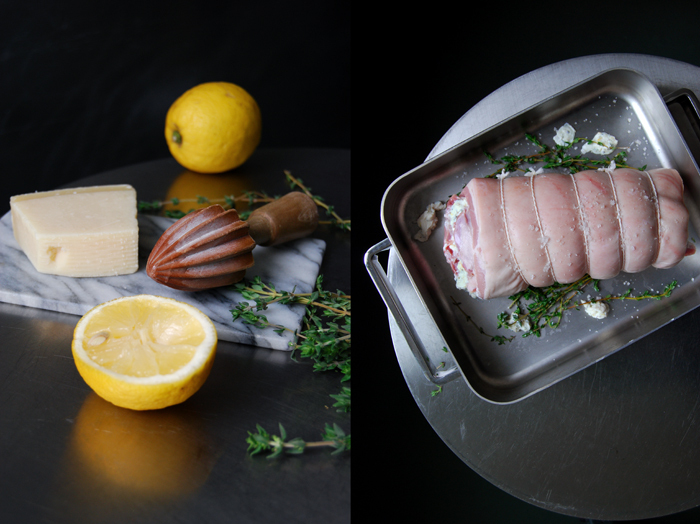 This scrumptious pork roll combines the hearty qualities of a juicy roast topped with crunchy crackling and the fresh spring feeling of ricotta, lemon zest, parmesan and thyme. If you liked my Bavarian Beer Roast for those cosy dinners at winter time, this is a great alternative for the warmer season, for a summery Sunday lunch under the bright blue sky and blossoming trees. It’s the perfect recipe to feast with your friends, the table filled with plates of crisp asparagus tomato salad, loaves of homemade bread and pink glasses of chilled rosé wine – and the roast right in the middle! You could use butterflied pork loin from a fully grown pig for this dish but I went for suckling pig. 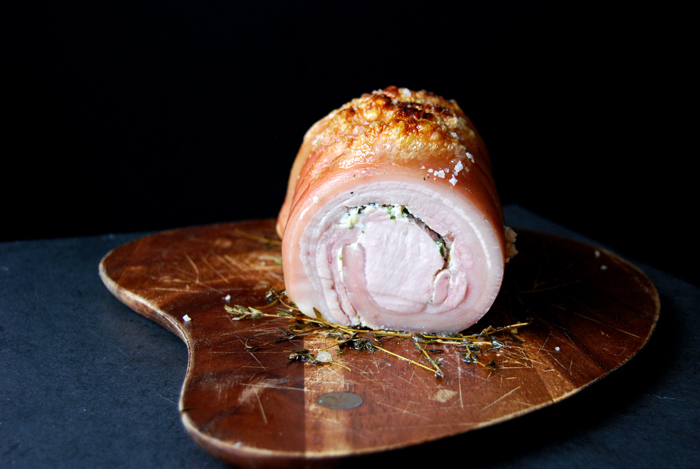 Its fine flavour and tender texture is exactly what you need if you want to roll up the loin with a light Mediterranean stuffing, no distractions, just the fine aromas merged with the meat. Suckling pig is a traditional German dish, you can often see it at village feasts in the countryside, a whole pig roast on a spit over the open grill. 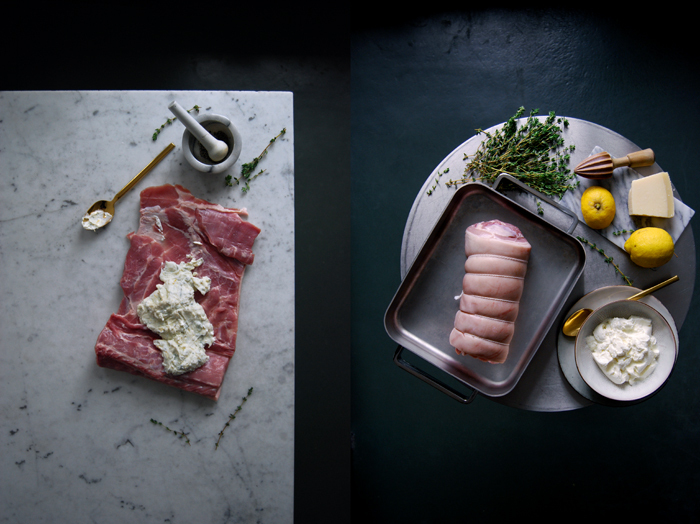 The scene can be a bit intimidating, it’s an archaic ritual – meat and fire. To me, it’s part of our nature and as I decided to include meat in my diet, I also decided to confront myself with various cooking methods, even the ones that aren’t as pleasing for the eyes as a schnitzel covered in breadcrumbs. Set the oven to 240°C / 465°F (I used the Rotitherm setting). Whisk the ricotta, lemon juice, zest, parmesan, thyme, pepper and salt. Lay the meat out flat on the kitchen top and spread with the ricotta-spice mix, leave a 2 cm / 3/4″ rim all the way round. Roll up the meat tightly without squeezing out the filling and tie with a cotton string every 3cm / 1″. Sprinkle the skin generously with sea salt (push it into the skin a little), place the roll in a roasting dish and roast in the oven for 10 minutes. Turn down the heat to 175°C / 350°F and roast for 35 minutes. Turn on the grill until the skin starts to crackle. Take the meat out of the oven, wrap in aluminium foil and let it rest for 10 minutes before serving. Serve with asparagus tomato salad or a light potato salad. The meat also tastes great cold, cut into thin slices, on a sandwich! This is lovely! The perfect combination of fresh and hearty which is just right at this time of year. I think this is an absolutely gorgeous roll. 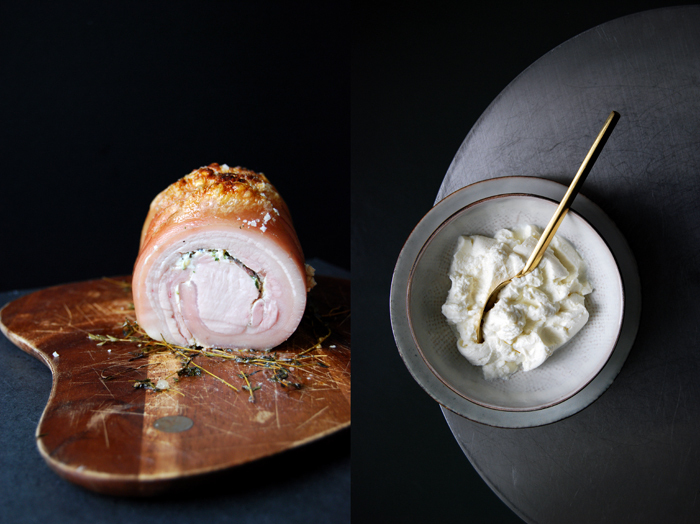 The combination of ricotta, lemon and thyme sounds very lovely. I have been scared of pork since starting to learn to cook – for some reason it intimidates me (maybe because I’ve only ever known home-cooked, pan fried pork chops), but this is something that might get me out of my shell. yum!